I found the perfect tote for my school supplies! Now that I'm teaching in a classroom setting, I'm having to haul a variety of heavy textbooks, a projector, a MacBook and an iPad to haul to school. I have been using a computer bag, a extra large Vera Bradley bag, a large purse and what I could carry in my hands to get all this in at one time. Very cumbersome and hard on my back! I just received the Crop In Style Rolling Tote that I ordered from Amazon.com and I'm happy to report that it's perfect! 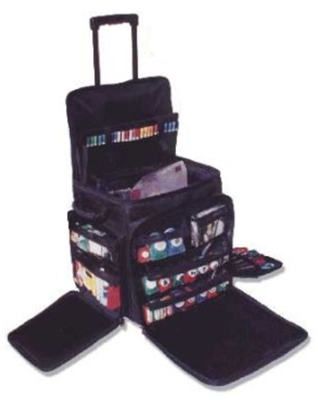 I use the front and side pockets for electric cords and miscellaneous papers and school supples. There are several padded slots inside where I can place my projector and my laptop, and there is STILL ROOM for textbooks and a notebook or two. It appears to be made well and should hold up for my use. I'll let you know if I change my mind about that over time. In the meantime, all I can say about this tote is an old,cheesy expression: Absolutely the best invention since sliced bread! I know this was made for scrapbookers, but teachers will love this tote even more. 100 stars! The biggest challenge has been the time it takes to create the lesson plans. I am doing my biology class in PowerPoint slides with videos for added interest. It's been fun finding the resources, but time consuming. The other challenge is my composition class. I have students of all writing levels, so I'm trying to find ways to help the ones who need additional help while challenging the ones who are more proficient. I have been reading through textbooks and other resources trying to find a solution, but I am ending up having to create my lessons from scratch. This, too, is time consuming! 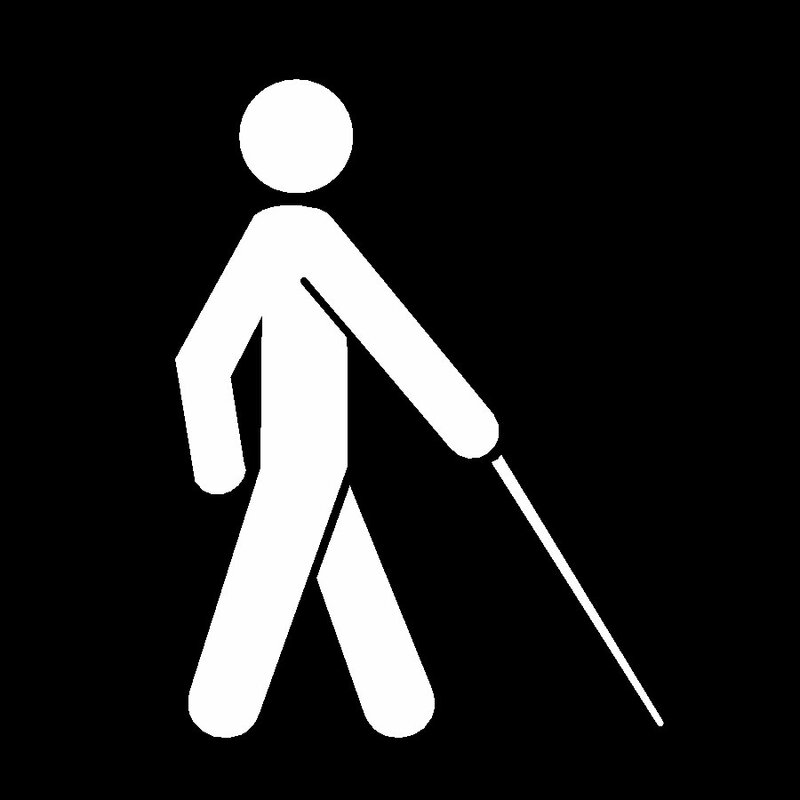 Logo of person with white cane. As many of you know, my husband Bill is legally blind. He began losing his vision in 2006 after a visit to get contacts. We visited eye specialists from here to the East coast in search of answer to why he was losing his vision, but no one seems to know. The specialists at Johns Hopkins in Baltimore, MD, finally decided it was probably genetic or an autoimmune disease. He said this is the standard answer when they can't figure it out. We were both hoping the vision loss was temporary; but, after consultation with doctors from Dean McGee, John Hopkins and Mayo Clinic, we finally had to accept the fact that, barring a miracle from God, he would probably not regain his sight. In the meantime, we were both struggling to adapt to these changes. Bill was struggling with his lost of independence. No more could he get in the car and go somewhere. He has to depend on me to drive him. I was struggling with a change of roles. Bill had always been the one who went out to work. He loves being with people and want to go, go, go. In contrast, I enjoy working at home alone and only like to go out on special occasions. It was the perfect marriage. He enjoyed going out and I enjoyed staying home. We were both happy. But now, our roles had reversed. How would I be able to take care of all the things that Bill used to take care of? How would Bill be able to adjust to staying home and being dependent on others? This was a scary time for both of us and we didn't know where to turn for help. The doctors only worked on a diagnosis; they gave no advice on where to get emotional support. In desperation, I began searching the Internet for blind support groups and only found one: National Federation of the Blind. We went to a meeting and quickly wished we hadn't gone. The leader of the group told us in no uncertain terms that if we came there because "Oh, I'm a poor little blind person and I need help, you've come to the wrong place." Both of us wanted to slide under the table and disappear. We stayed for the meeting, but were so glad to go home. That was definitely not the help we were looking for. We went home and prayed for help from somewhere else. Finally, after searching the Internet some more, I ran across a small posting from a person who ran a support group in Tulsa called the Tulsa Council of the Blind. We went to the meeting and found just what we were looking for. They were helpful, supportive and caring. They told us where to go for more help and who to contact. This was the breakthrough we had been looking for. From there, Bill has been able to get help from the VA, the Oklahoma Department of Rehabilitation, and more. Emotionally, we have both learned to adapt and are making progress in getting back to a new normal. I said all that to say this: I have just finished creating a website for Tulsa Council of the Blind. My goal is that this website will not only make easier for someone to find this organization, but that it also will help others get the help they need when going through a transition such as ours. With the help of the staff, I have including information about the organization and its services, as well as links to other websites with helpful information for both the visually impaired as well as for the family and friends of the visually impaired. While on the site, you'll learn interesting facts about the blind, gain knowledge about the causes of blindness, discover resources for helping the blind gain confidence and independence, and even find educational resources for parents of school-age children who are blind or visually impaired. If you know anyone who is losing their vision, please send them to the Tulsa Council of the Blind website. And if you have a website or blog or Facebook page, please link to the website so that others can find it. Don't let them go through this alone! UPDATE: Sept 21, 2012. I just received a nice note from the new president of NFB apologizing for the treatment we received at the NFB meeting. It's nice to know that someone cares enough to reach out and make it right. Attention Liberals – Do NOT buy this game. You will hate it! On the other hand, if you’re a conservative or Libertarian, you’ll absolutely love it. 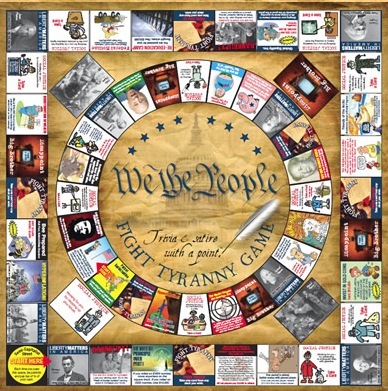 We the People plays like any other board game – throw the dice, move around the board, draw a card and do what the card says. The difference is that this game takes a satirical look at our government and liberal policies in particular. For instance, you might land on a Social Justice card like this one: The Federal government sues Microsoft demanding the “bullets” feature be removed from their local tool bar because the word may provoke violence. A compromise is found and the word “bullet” is replaced with the more politically correct term, “happy dot.” All players pay $1,000 for each computer they own (in real life) to buy non-offensive software. But don’t think that it’s all laughs and no learning. 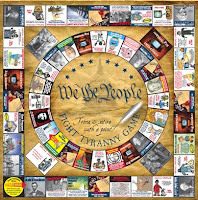 There are five categories of trivia cards including Portraits in Time, Stubborn Facts, We the People, Spoken Identity, and In God We Trust. As you play the game, you’ll learn about America’s spiritual heritage, the Constitution, famous people in America, and historical facts from American history. As players go around the board, they gain and lose money, as well as stars depending on where they land. Stars are earned by knowing the answers to the trivia cards. The winner is the one who has the most stars at the end of the game. It’s easy to learn to play – no complicated directions. The game is promoted as being for 3-8 players and for ages 15 - adult. Perhaps some kids younger than 15 could play it, but they probably wouldn’t get the satire. I definitely got more than a few laughs from playing the game and learned something as well. However, I will warn you. It is controversial; and, if you don’t all have the same political leanings, you might end up in an argument with your friends!